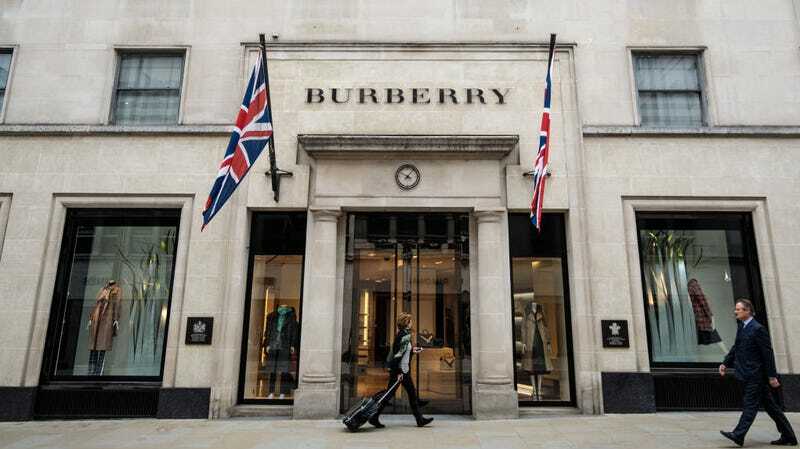 British luxury fashion house Burberry intentionally destroyed more than $36 million worth of its own products in the past year alone, the Guardian reports. Let me be clear—the label literally burned fashion and cosmetic products carrying the Burberry trademark, because capitalism is a nonsensical loop of wastefulness. Burberry explained that the cosmetics needed to be destroyed because its beauty line has recently been acquired by Coty, a multinational beauty company. However shareholders at the company’s annual meeting demanded to know why investors weren’t given the chance to purchase some of the unsold stock. I would personally love to know why the clothing wasn’t recycled, or donated, or sold at a discount to raise money for charity, or used for literally anything else instead of being sent up in ozone-depleting air-polluting capitalism-induced flames. Stitch all those coats and scarves together to make a giant Burberry-branded hot air balloon that can carry us up and away from this hellish planet. Burberry claimed to take environmental concerns of this destruction very seriously, and used special incinerators that allow the energy from the burning process to be harnessed for other uses. This is my official request that we use that energy to power a giant blimp that reads “End Sweatshop Labor.” Or, you know, pay workers in the garment industry a fair living wage.